06/09/2016 UPDATE: The paper has been accepted and is now published. The final version is available from the journal. 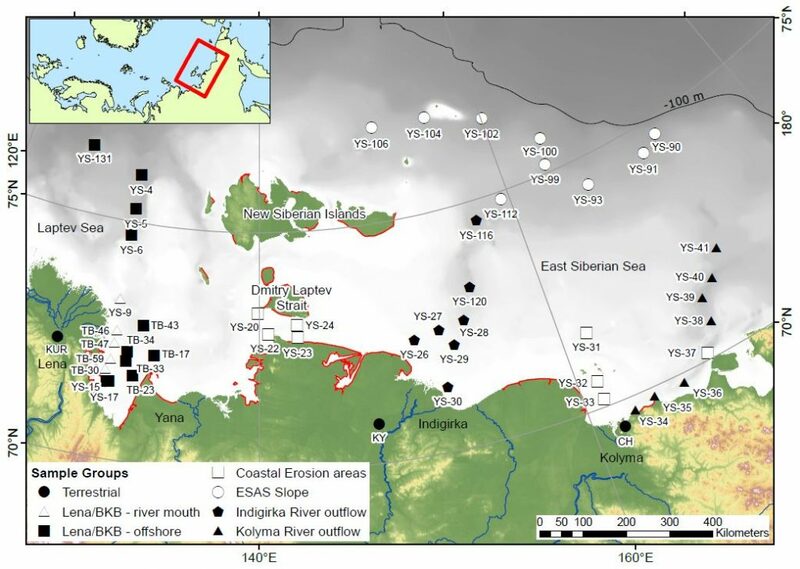 Our international team of East Siberian researchers currently has a paper in open review at Biogeosciences. The discussion paper, and its interactive comments, can be downloaded from the journal website. Note how the soil marker concentrations are highest (orange colours) near to the rivers and coastlines. 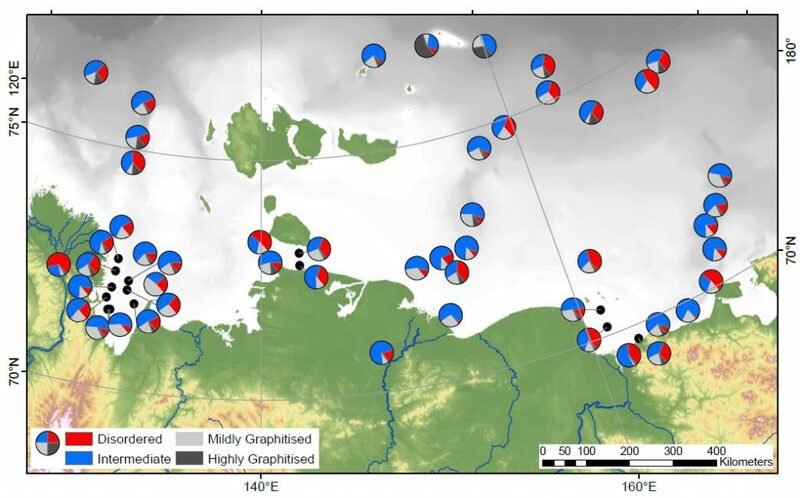 By measuring the concentration next to the river mouths, and in the sediments being washed away by coastal erosion, we show that it is not just rivers that are delivering the soil markers to the Arctic Ocean. 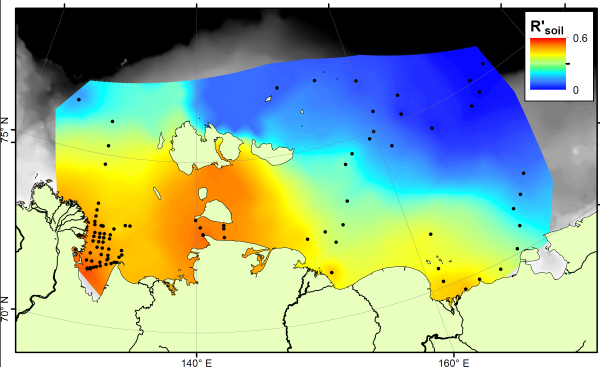 The R’soil index shows that all along the East Siberian Arctic coastline, offshore sediments are dominated by carbon from the land. As you go further offshore, especially in eastern parts nearer to the Pacific Ocean, marine carbon is more important. This result shows a similar pattern to that seen using stable carbon isotopes, but is different to the pattern shown by the BIT index. Therefore these two indices, both based on microbial biomarkers, are tracing different parts of the carbon cycle. The Guardian newspaper today reported on an interesting set of photographs today documenting one side effect of warming permafrost. Photographer Amos Chapple travelled to the East Siberian region to mine prehistoric ivory from permafrost. 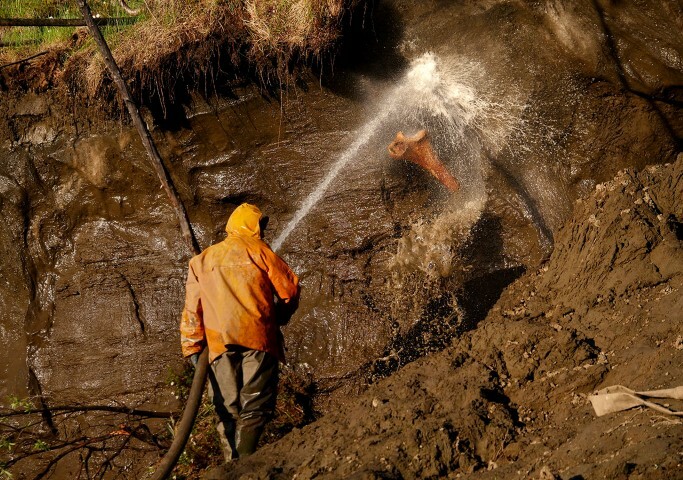 Locals had discovered tusks emerging from the river bank as rising temperatures coupled with erosion to uncover bones and tusks that had been buried for thousands of years. The photographs are well worth a look, documenting the extreme (and extremely dangerous) lengths that the ivory miners (“tuskers”) will go in order to find ivory worth tens of thousands of dollars per piece. They carve caverns into the permafrost using high pressure hoses, leaving behind a pock-marked hillside and a river full of debris. A successful find will net more than $50 000 in cash, and the carved products will be sold for millions, likely in China. While the payback for the few who strike lucky can be life changing, the damage to the local ecosystem, and the likely increase in permafrost degradation and carbon release due to this activity, means that the long-term regional and global consequences will far outweigh the local gain. 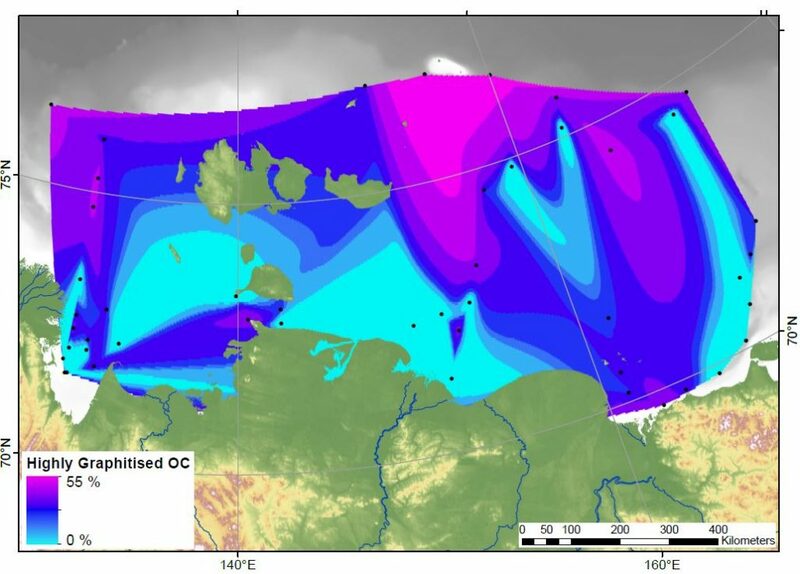 The February issue of “Organic Geochemistry” will include a paper by David Grewer and colleagues from the University of Toronto and Queen’s University, Canada which investigates what happens to organic carbon in the Canadian High Arctic when the surface permafrost layer slips and erodes. This is a paper that I was involved in, not as a researcher but as a reviewer, helping to make sure that published scientific research is novel, clear and correct. 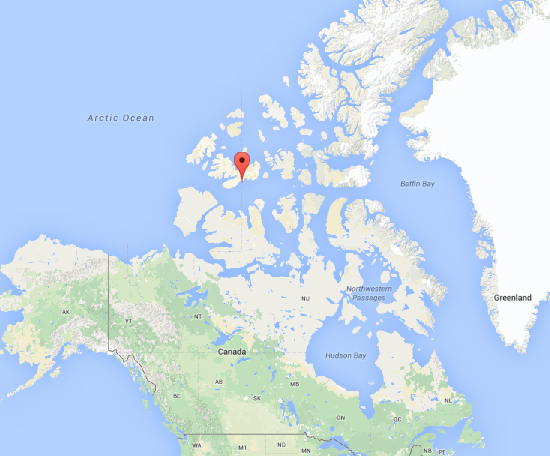 The researchers visited a study site in Cape Bounty, Nunavut, to study a process known as Permafrost Active Layer Detachments (ALDs). The permafrost active layer is the top part of the soil, the metre or so that thaws and re-freezes each year. ALDs are erosion events where the thawed top layer is transported down the hillslope and towards the river. Rivers can then erode and transport the activated material downstream towards the sea. The team used organic geochemistry and nuclear magnetic resonance spectroscopy to find out which chemicals were present in the river above and below the ALDs. The found that the sediment eroded from the ALDs contains carbon that is easily degraded and can break down in the river, releasing CO2 to the atmosphere and providing food for bacteria and other micro-organisms in the water. Russia is big, really big, and to go with that, it has some very big rivers. The majority of the Russian river outflow is into the Arctic Ocean, especially in the central and eastern parts of the country, and this is generally concentrated into a series of very large rivers. The largest of these are known as the Great Russian Arctic Rivers (GRARs). 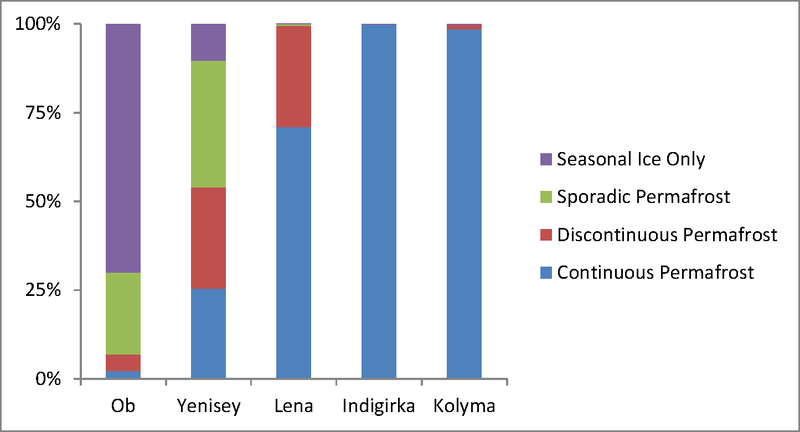 From west to east, these are the Ob, Yenisety, Lena, Indigirka and Kolyma, of which the Ob and Lena are largest, and Indigirka the smallest (small enough to not count in some people’s list of GRARs). 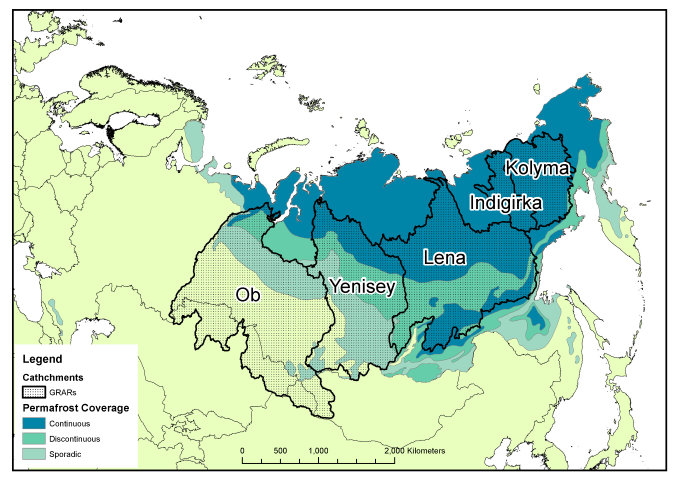 The Ob river is the world’s fifth-longest and has the sixth-largest drainage basin, yet has only the 19th highest annual discharge, being overtaken by the smaller Yenisey and Lena rivers to the east of it. All of these river basins contain some permafrosted land, which can reduce discharge during the winter months and have a very large flood-period in late spring / early summer when the meltwater arrives (the “freshet”). 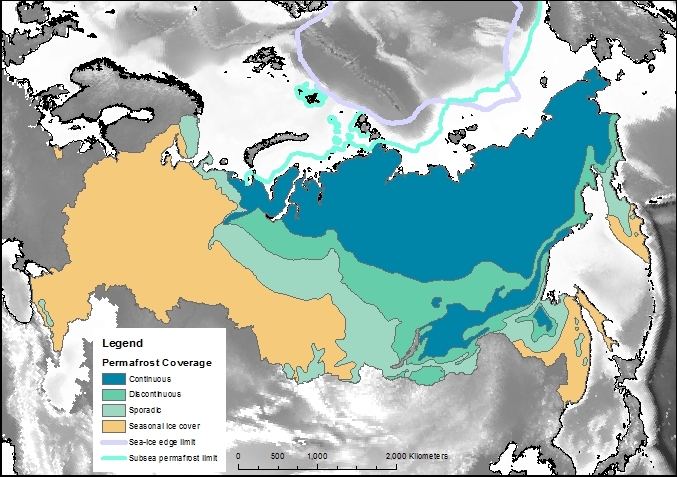 As the amount and continuity of permafrost increases from west to east, so the proportion of each permafrost type increases within the river basin. 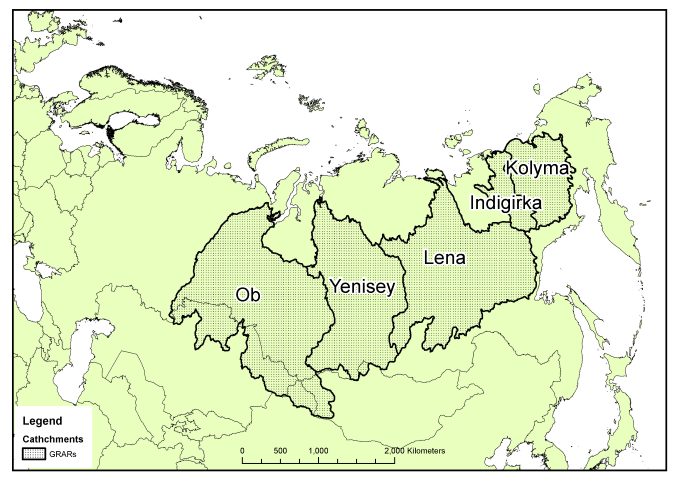 The Ob and Yenisey are largely free of continuous permafrost, allowing water to flow through the ground to the bedrock and into the river, whilst the Indigirka and Kolyma are practically 100% continuous permafrost, and thus any water discharging will have run along the top of the ground before entering the river itself. This can have consequences for the type of material, especially carbon, carried by the rivers. This east-west contrast is worth exploring in more detail in a later post, since it shows how Siberia may behave very differently if the permafrost were to thaw. As a final reminder of just how large the rivers are, even the smallest, Indigirka, manages to cover more area than the British Isles! As usual the full-resolution PDFs of the figures from this article can be downloaded here: River catchments no permafrost, Catchments and permafrost, Permafrost chart, Catchments and UK. Posted on 21 March, 2014 18 March, 2015 Categories What Is?Tags map, permafrost, rivers, Siberia, whatisLeave a comment on What Is: GRAR? Just how much permafrost is there? Permafrost covers 24% of the Earth’s northern hemisphere land surface, but how much is that? Well 24% corresponds to 23,000,000 km2. 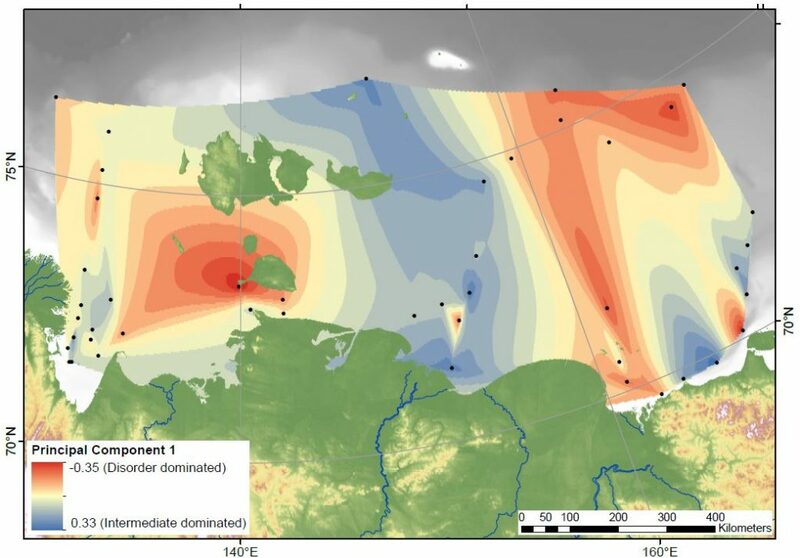 That is a pretty big number, and doesn’t even count the subsea permafrost that covers lots of the Arctic Shelf (see the map above) so here are a few comparisons and measurements in less standard units. 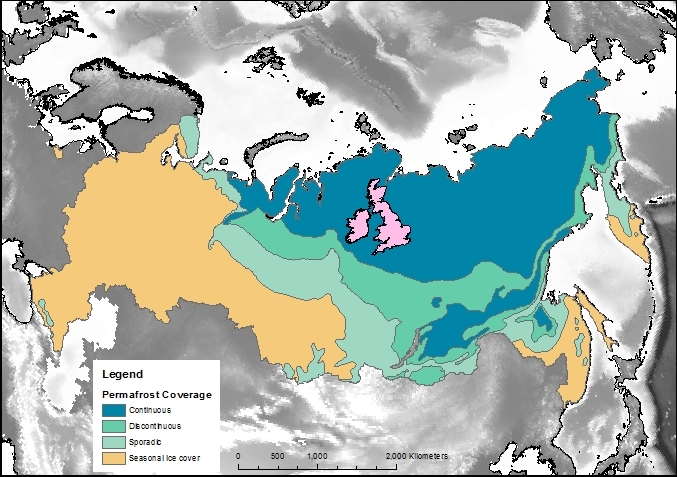 Great Britain compared to the Russian permafrost area. Firstly, let’s compare the permafrost area to some other countries and continents. Here is Britain in comparison, at 243,000 km2 it is almost inconsequential. Only one tenth of the northern hemisphere permafrost. Going up the scale Australia, with an area of 7,700,000 km2, is one third of the northern hemisphere permafrost, and roughly the same size as the 7,400,000 km2 that continuous and discontinuous permafrost represent in Siberia alone. PDF versions are also available. Map1, Map2, Map3. 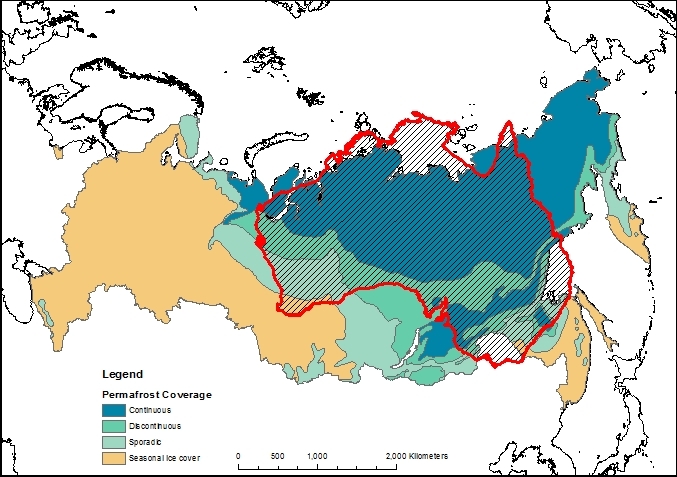 Posted on 18 June, 2013 Categories News and ViewsTags map, permafrost, Siberia1 Comment on Just how much permafrost is there? When most people talk about permafrost, they think of frozen, empty soil with very little living on it, in it or near it. They think of a harsh, icy environment with glaciers, blizzards and possibly a few reindeer roaming around. But permafrost is much more varied than this. It does not necessarily have a covering of ice, but can be a thin layer of grass or peat with frozen soil underneath it, there can even be forests growing on the surface with frozen soil underneath them. There can be animals living on it, and bacteria living within the sediment. In fact, the permafrost might not even be on land! Here are just a little information about permafrost and what it contains. Northern Hemisphere Permafrost. 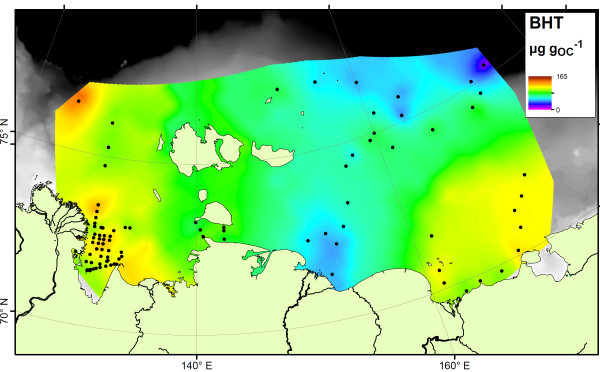 Also shown are subsea permafrost and the Arctic ice cap. Permafrost soils, which are frozen so solid so you need a pneumatic drill to sample them, cover a quarter of the northern hemisphere land area, and can be up to 1500 m thick. They store more carbon than there is in the entire atmosphere. The very top layer will thaw each summer and freeze each winter, which allows plants to grow and animals to graze, but the lower parts remain frozen all the time. In the southern parts, there can be trees growing on top of the permafrost, this is known as the ‘taiga’. When it is too cold, and the growing season is too short, only grass, moss, shrubs and lichen can survive, this is the ‘tundra’. 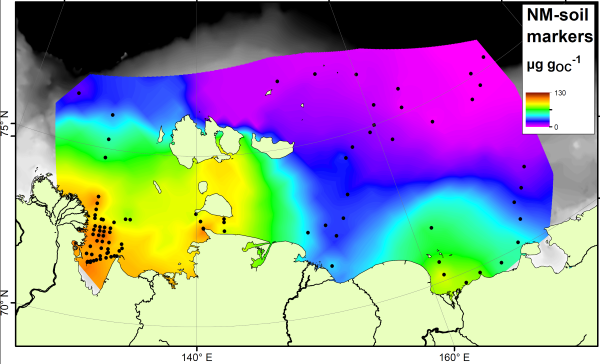 Another example of permafrost is frozen methane-ice trapped on the seabed. Subsea permafrost is often ignored, but these icy crystals of frozen, flammable gas and water contain a large amount of trapped carbon, are prone to melting and gas release, and have been blamed for one of the most extreme climate events in geological history. The map shown above can be downloaded here. 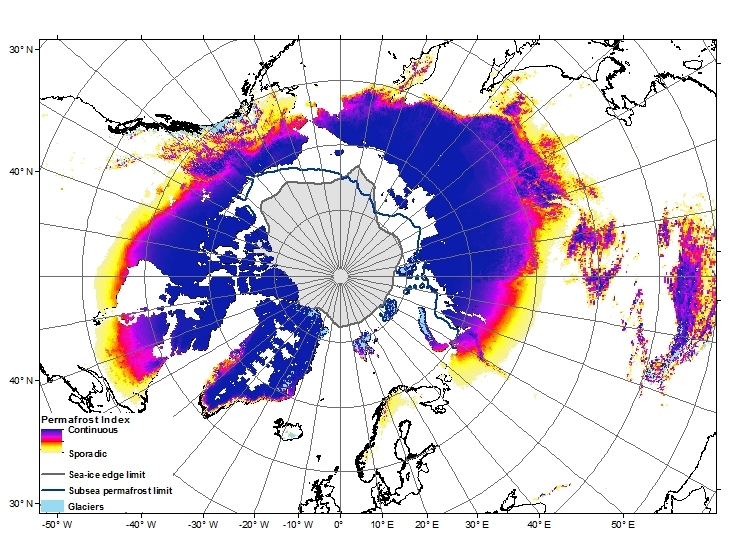 The data was sourced from the University of Zurich Global Permafrost Zonation Index Map. Posted on 3 June, 2013 18 June, 2013 Categories What Is?Tags permafrost, whatis1 Comment on What is: Permafrost?